Our Team - A+ Japanese Auto Repair, Inc. Specializing in: Honda Repair, Acura Repair, Toyota Repair, Lexus Repair, Nissan Repair, Infiniti Repair, Subaru Repair, Mazda Repair, Mitsubishi Repair, Hybrids & more. Specializing in: Exceptional client education, support, and satisfaction. Honda Repair, Acura Repair, Toyota Repair, Lexus Repair, Nissan Repair, Infiniti Repair, Subaru Repair, Mazda Repair, Mitsubishi Repair, Hybrids & more. Specializing In: Auto Repair Service Advisor. Knowledgeable in Honda Repair, Acura Repair, Toyota Repair, Lexus Repair, Nissan Repair, Infiniti Repair, Subaru Repair, Mazda Repair, Mitsubishi Repair, Hybrids & more. Specializing on: Customer service. Specializing In: Auto Repair Service Advisor. Knowledgeable in Honda Repair, Acura Repair, Toyota Repair, Lexus Repair, Nissan Repair, Infiniti Repair, Subaru Repair, Mazda Repair, Mitsubishi Repair, Hybrids & more. Adam Sevim started A Plus Japanese Auto Repair in 2001 with his brother Eric. Adam has experienced first hand some of the industries real issues outside his business through his involvement with automotive service councils (ASC) and automotive service association (ASA) and through his commitment to better our industry has dedicated himself to providing the highest level of automotive repair and service. This commitment has made A Plus Japanese Auto Repair a leader in the independent auto repair shop business. Adam and Eric have since increased the success of A+ Japanese Auto Repair, Inc. by continuing to maintain great relationships with clients and by providing the best auto repair on the peninsula. In his spare time Adam is always fabricating and attaching something new to one of the vehicles in his fleet of expedition ready Land Cruisers. Ask Adam Where his next Overland Expedition Journey/Adventure will be! When he is enjoying his free time, he can be found mountain biking, giant slalom skiing, crossing the Mojave desert, Moab, or death valley in a Landcruiser, or hanging out with family and friends. Specializing in: Subaru Repair, Mazda Repair, Toyota Repair and Mitsubishi Repair. ASE Master Certification. Diagnostic Technician. Since the 1970's Keith has been earning automotive certifications and increasing his knowledge of automotive repair and maintenance. He holds nine ASE Certifications, is a ASE Certified Master Technician and also has his smog license (A+ does not perform smog checks). He has been with A+ Japanese Auto Repair for many years and offers a plethora of knowledge to his coworkers. ASE Certifications: Engine Repair, Automatic Transmissions/Transaxle, Manual Drive Train and Axles, Suspension and Steering, Brakes, Electrical/Electronic Systems, Heating and Air Conditioning, Engine Performance, and Automobile Advanced Engine Performance. Quin holds four ASE Auto Repair Technician Certifications and has been one of our Japanese vehicle specialists for the past four of his 12 years in the automotive industry. He takes pride in his work and is committed to providing complete diagnosis and auto repair for our clients. Quin also specializes on converting the Toyota Prius to a plug in with the Hymotion battery. When he is not at A+, Quin can usually be found listening to 80's disco music while doing something creative such as customizing his tricked out Honda Civic with some electrical madness. He can take just about anything apart and put it back together, better than before. ASE Certification: Suspension and Steering, and Brakes. Joe has been with A+ Japanese Auto Repair Inc. since 2011 providing quality auto repair and service. When he is not working at our shop, you will find Joe Drifting in his Frankenstein 240sx taking first place... usually. Areas of expertise: Engine Repair, Automatic Transmission/Transaxle, Manual Drive Train and Axles, Suspension and Steering, Brakes, Electrical/Electronic Systems, Heating and Air Conditioning, Engine Performance, and Automobile Advanced Engine Performance. Fatih began his automotive career in 1992 with a commitment of providing high quality auto repair on each job regardless of how big or small. He has been providing the highest quality of automotive repair and maintenance for A+ clients since 2008. Fatih has been continuing his training learning about new hybrid models emerging into the US market. Fatih is also an expert at automotive repair and maintenance on Nissan cars, Mazda cars, Infiniti cars, and Subaru cars. Kory began his automotive career with A+ Japanese Auto Repair in early 2012. Kory has been a service advisor and service manager at many facilities and dealerships before joining our team. Kory brings a wealth of knowledge with him in car repair and service, client relations, and service consulting allowing him to provide our clients with excellent customer service. Kory is an avid aviator in his spare time. If you see restored WWII aircraft flying above you in the skies of the bay area chances are Kory is up there enjoying a day off. Jose began his automotive career in with A+ Japanese Auto Repair in 2012. He has completed multiple classes at UTI (Universal Technical Institute) Automotive Institute. While Jose was at UTI he stood out to us due to his grades and being top of his class. Jose Started with us as a shop assistant. You may have had the pleasure of riding with Jose as he has filled in as a shuttle driver on occasion. Today he has progressed into an apprentice technician and lube tech with the help of our ASE certified technicians and knowledgeable staff. 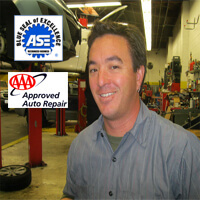 Kasey began his automotive career in with A+ Japanese Auto Repair in 2010. Kasey is a mechanics apprentice that fills many shoes at our facility. Kasey helps co-ordinate rides, deliveries and makes sure your parts are here on time! 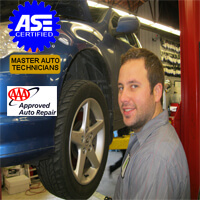 Kasey has also had lots of hands on training with our Master ASE certified technicians. Kasey's in house training has helped him to progress into a reliable apprentice technician and lube tech and an asset to our our staff. Steve began his automotive career in 2012. As a previous shop owner Steve understands the value of offering clients an excellent customer service and car repair experience. Steve's many years in the automotive repair and service industry brings a wealth of knowledge and expertise to our facility. 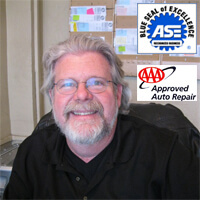 We are very fortunate to have Steve on our team of ASE certified auto service advisors. Contact Steve for any car repair and service needs you may have. 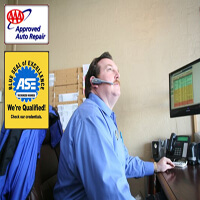 Jason started providing our clients with excellent care repair and service in late 2012. 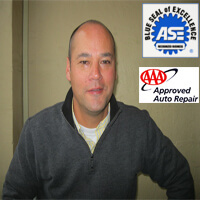 Jason is a welcome addition to our team ASE certified auto repair mechanics. Jason has many years of expertise in Mitsubishi car repair & service, Honda car repair & Service, Acura repair & service, Toyota car repair & service, and Lexus car repair and service. In his spare time Jason can be found skydiving as an instructor and photographer over California. Jason splits his spare time between skydiving, drifting (racing vehicles), and his family. We are fortunate to have this skilled mechanic on our team.